One more big kit to put in the display case. 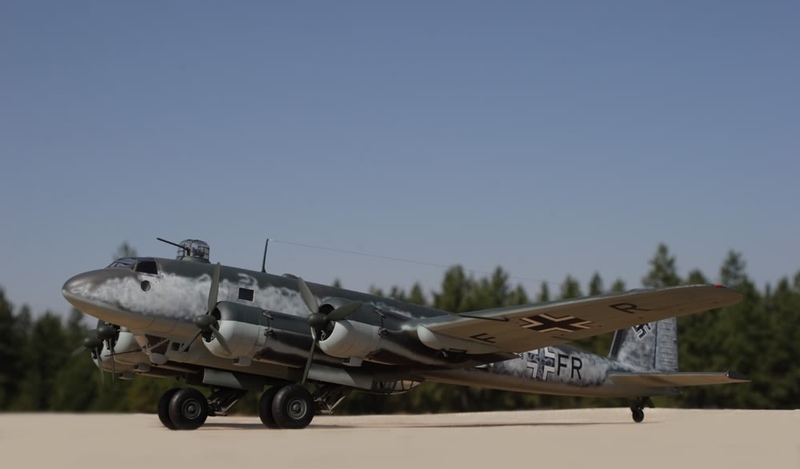 This was one of the Luftwaffe aircraft that I was hoping we would see in 1/48 scale. To date there has only been one other model in 1/48 and that was the MPM resin kit. I was lucky to have one, but there was just too much work involved to make it into a good-looking model. The kit did not have any interior parts – the instructions were there for finishing the interior, but no parts. Then Trumpeter announced that they were going to do the Fw 200. I was looking forward to adding it the display case with the rest of the Luftwaffe collection. At first glance, it appeared that there would be some work to this one as well. It is just like the TU 95….it looks good, but once that you start building it you need to add things. The first thing is the interior - you get it all, the full tanks and a good cockpit and that will be the only thing that you will be able to see when you close up the fuselage. I painted the cockpit area RLM 66, and the rest of interior RLM O2. 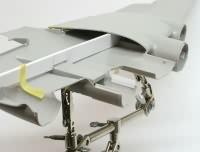 Trumpeter makes some nice seat belts for their 1/32 scale aircraft - I wish they would do the same in 1/48 as I had to add some to this kit. I added some color to the instruments and added some other little things to help it look nice. 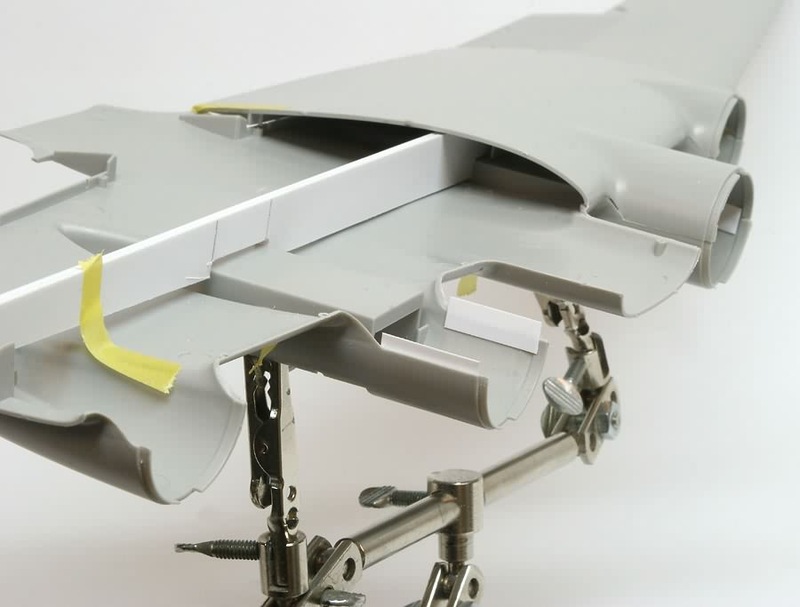 One thing that has been said about the kit is the lack of wing spar - there is no wing support without a spar, but they don’t include it in the kit. I was going to make a spar, however there was a good article in IPMS Philippines on the kit and some information on the build. They had a drawing of a wing spar that you could put in and this would take care of the wing sag and give some support of the wing to the fuselage. It was a very easy thing to make and fit right in, but there is still some cutting that you will have to do on the cabin floor to make it fit. If you follow the drawings you will not have any trouble with it. This would be the next step when you are working on the interior of the kit. I also added some more support to the nacelles where they join up. 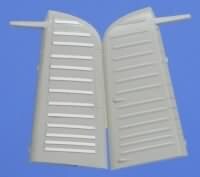 This will give more support to them when you are sanding them and you will need that. There was no trouble with the landing gear. It will support the kit. I did add some brake lines to it and that is all. I did not put the gear in until the model was all done as it is just too big to move around when you are painting it and trying not to break off the gear. 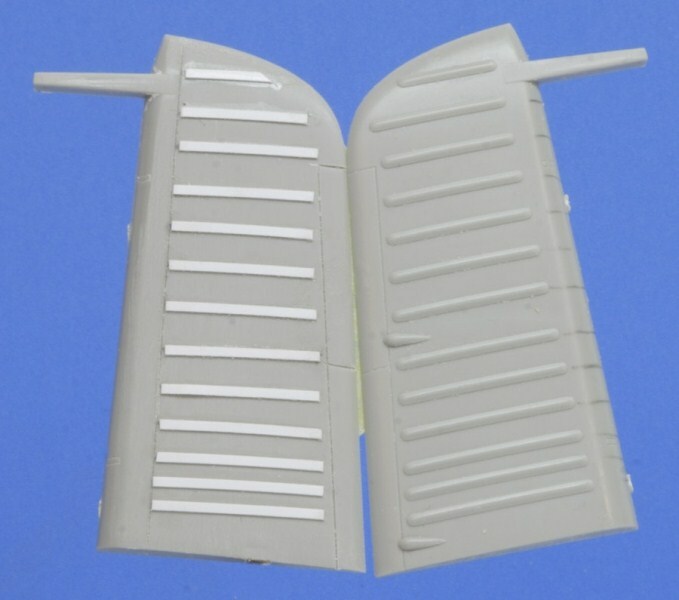 The same with the flaps; if you are going to have them down they can be added when you have it all painted. On to the control surfaces. Yes I do think they are overdone. Trumpeter tends to overdo the ribbing on the control surfaces so it requires a lot of filling and sanding. I sanded the rudder, the ailerons and the elevators down. The ailerons were only overdone on the top and had nothing on the bottom. I cut some 10 thou plastic strips to fit the ailerons and glued them on both top and bottom. I then sanded them down and put on three coats of Mr. Surfacer 500, sanding after each coat. It looked a lot better than what I started with. I did the same with the rudder. On the horizontal stabilizers I painted them with Mr. Surfacer and sanded them down each time and it did help out. The engines were next. You will have to take your time when you put them together - the fit is not that good. I had to add some support to the back of the engine so it would fit better in the cowling. There is some work to make the exhausts fit into where they are to go, and I did not put them in until I had the model painted. I also added some extra plastic strips to the fuselage where the wing will fit. This will give a better glue joint for the wing to the fuselage.....and you will need it. When I got the fuselage all glued I put the windscreen on. There is some work to make a good fit and this is the best time to do it. I then taped out all the windows and did the last sanding - make sure that there were no imperfections that you would see. Next is the painting. I wanted an interesting paint scheme for the Fw 200 and I found a picture in Aufklarer Luftwaffe Reconnaissance Aircraft & Units 1935-45. 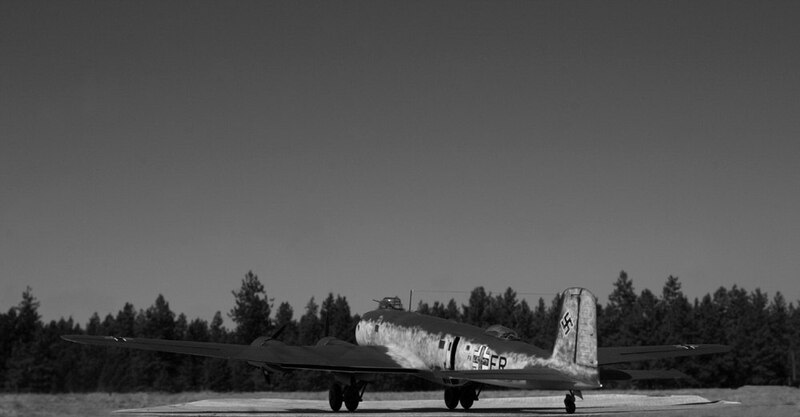 This Fw 200 was based in Norway in 1945 and was very different from all the rest of the Fw 200s. In the picture the aircraft had white or RLM 76 painted on the sides of the fuselage. It is a very interesting color scheme, with white fading camouflage. I first started off with the RLM 71/72 for the upper and 65 for the undersides. I use an Iwata HP-SB to do the white wave lines and fading of the white on the sides of the aircraft. I then gave the model a coat of Future and let it dry for a day and started to put on the decals. I had to make some new letters for the fuselage and wings and printed them. I used some of the kit decals but for the most part I used some of my stash of German decals. With all the markings on I put a coat of Future on and let dry. I then started to weather it with an oil wash. Then a coat of flat. With that all done now it is time to add the landing gear and doors, the flaps, the clear turrets parts, and finally the antennae. Was it worth it? Yes, just to have a model of a four engine German aircraft in 1/48 scale. I will have to make a new shelf to put it on for it is so big. While working on the FW 200 I got the new kit of the 1/32 scale Me 262 and I just could not put the Me 262 down..... so I put the Fw 200 up and started on the Me 262. You could see that it would be a fast build, and it was, It would been nice if the Fw 200 was as good as the Me 262 and the new kit of the SBD that I just got. 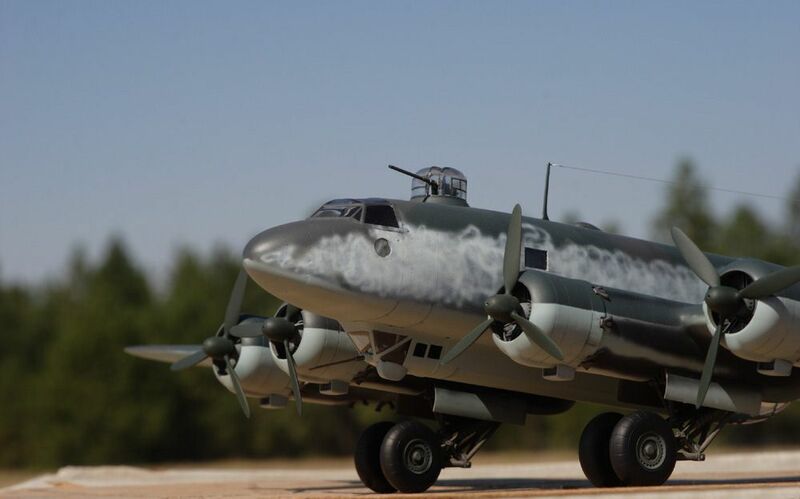 In looking at the kit of the FW 200 you could see that it was one of their old engineered kits, like the TU 95 and SM79. 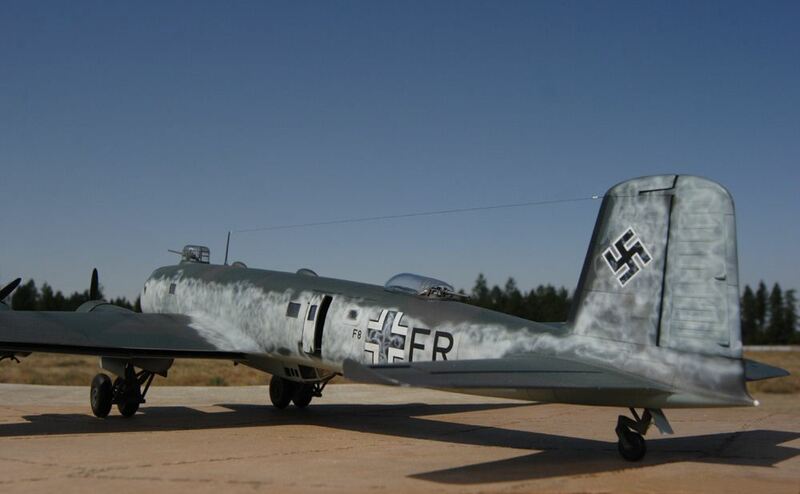 So I do hope that some of the new kits that they are coming out with will be like the Me 262 and the SBDs. Thanks to Stevens International for the review sample.